Are you posing rabbits...or molding them? Pose Your Rabbit for the Show … Or mold it? Editor’s Note: This is one of my favorite articles on the Nature Trail. It is written for the Holland Lop breed, however the concept applies all across the board. You can physically manipulate any breed to appear better than it is, however you are only fooling yourself and it will lead to inconsistency on the show table. We would like to add to this article so that it will encompass more breeds. If you would like to contribute, feel free to contact us. To learn how to pose a commercial or compact typed rabbit, visit this page. To learn how to pose a Holland Lop rabbit, visit this page. Pose or Mold Your Holland Lops? Learning to pose your Holland Lops is an extremely important skill for any Holland breeder. In fact, it’s an important skill for the majority of breeds. But getting too good at posing can be detrimental to your breeding program. How in the world is that possible? Some breeders and even some judges have developed their ability to pose and position so well that they have begun to mold the rabbit. They have learned how to smush the rabbit into the best looking position for the rabbit, perhaps even hiding a major fault. That’s molding, not posing. When I was a total newbie, I remember someone describing a rabbit with a fault, but then that person added, “but he poses out of it.” I thought that meant that the fault wasn’t that bad or even that the fault didn’t matter because he could be posed in a way that disguised his fault. I no longer accept that notion. Molding rabbits allows a breeder to lie to him- or herself. And once the lie is accepted, the rabbit is bred into the herd as if it did not have the fault at all. It would be so much better to pose the rabbit correctly – with the front feet under the eyes and the back feet under the hindquarter and not pushed up behind the front feet. Then be honest about the rabbit. Acknowledge the fault. If the rabbit is otherwise worthy of breeding, take the fault into consideration. Or, if the fault bumps the rabbit not from show to brood, but all of the way down to pet, then take appropriate actions and don’t perpetuate the problem until one day you have a herd of Hollands that must be molded correctly to get them to look good. I once saw a judge use a rabbit he was judging to illustrate a low head mount. He posed the rabbit, but didn’t mold it. The head lay naturally more in front of the rabbit than on top of the shoulders. When he was finished with his comments, the breeder posed up the rabbit really high at the end of the table to show that judge that he was in error. It is my opinion that the breeder was molding the rabbit, having taught it to compensate for a fault. It was obviously stretching up to an uncomfortable or, at least, unnatural pose. A few months ago, a judge announced to the Holland breeders that we needed to work more with our rabbits to get them to pose better for the judge. I take exception to that. I think we need to work with our rabbits to get them past shyness or stubbornness, but I think that teaching rabbits with low headsets to sit up in an unnatural pose perpetuates a problem. A correct Holland that is neither shy, frightened, nor stubborn poses correctly because that is what their body is comfortable with. I also think that rabbits with long shoulders can be posed up to look short and deep when they are really long and flatter. Either you can make them look like they have a lovely topline, only to find that they really have a shallow chest (put your thumbs on their shoulder and your fingers under the chest – is it huge like a Big Mac or thin like a kiddie burger?). Or, they are posed up very high where the depth and length no longer balanced, the rabbit looks like a vase, as one breeder so aptly put it. Then there’s toe-tucking. Yes, when a judge poses a Holland, they should set the hindquarter square. But if the toes keep sticking back out, I don’t think the judge should continually tuck them back in. Likewise, when you evaluate your rabbits’ hindquarters, you should set your rabbits square, but then look to see how the back feet naturally lie and be honest with yourself. I like to look at them several different ways before deciding. 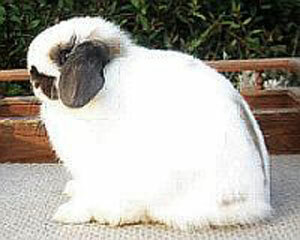 The back legs are an extremely moldable part of the Holland Lop, and probably many breeds. I still struggle with the line between posing and molding. By the time I have a buck or doe that is old enough to show, I’ve invested quite a bit of time and work, and a whole bunch of expectation in it. I want to see a wonderful rabbit in each bunny I produce. But I’ll do myself no favors by being anything less than totally honest with myself.